GREEN BAY — Eliot Wolf has a magical last name, and he appreciates what it’s meant to his career and the resurrection of the Packers. “I think it’s really good. I wouldn’t be standing here today. I understand the doors my dad opened for me,” Wolf said on Tuesday, in a press conference that previewed his presentation of his father for induction to the Pro Football Hall of Fame on Saturday. “We used to joke when I was a kid. ‘Hey, dad, when you get to the Hall of Fame, can I be your presenter?’ It was surreal when he asked me. It’s pretty good,” Wolf said. Ron Wolf turned the Packers into winners. As the team’s GM, he traded for Brett Favre and signed Reggie White in free agency. His teenage son watched as it unfolded. “I think it’s special. You can walk through the halls and see pictures of the great players he brought here. 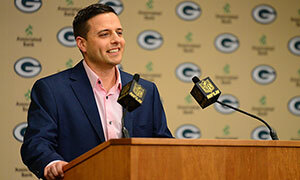 To see he’s added to (the Packers’ mystique) is really special,” said Eliot, who’s risen through the ranks to become the Packers’ director of player personnel. He wrote his first scouting report as an intern for the Falcons. The report was on a Maryland junior cornerback named Chad Scott. “I gave him a first-round grade,” Eliot said. Scott was drafted in the first round. In Canton, Ohio, this weekend, Ron Wolf will realize what he considers to be the ultimate honor. “How much he respects the NFL and respects the game of football. It’s really cool to see how special it is to him that he’s a part of that now,” Eliot said. “The thing Ron was so good at it is the inclusion of other people. Ultimately, it was his call, but he would include everyone in the conversation,” current Packers GM Ted Thompson said.